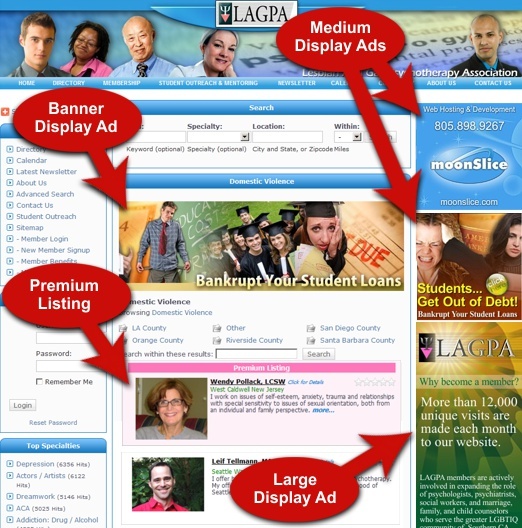 We are offering exciting new ways to promote your business in the LAGPA website and directory, in addition to the Membership Standard Directory Listing. To assure you get noticed, you now can upgrade to a Membership with a Premium Listing and/or also purchase Display Ads. This added exposure is illustrated in the graphic below. A Premium Listing places your business above all Standard Listings for all searches (by category or keyword) in a clearly marked colored box. Compare Listing Levels and Features but do NOT add a new Membership/Listing. to tell us which Premium Level you want and we will upgrade for you. The amount extra you owe will be based on the time remaining before renewal so you don't overpay. Be sure to include your Business name or Invoice # in the contact form so we can identify you. Banner Display Ads: featured prominently at the top center of all category listings in the website's directory, in rotation with other banner ads. Specs: size=534 x 168 pixels; format=jpg, gif, or png; color profile=RGB. Medium Display Ads: featured in the top right column on every page of the website, in rotation with other medium ads. Specs: size=199 x 201 pixels; format=jpg, gif, or png; color profile=RGB. Large Display Ads: featured below the medium display ads in the right column on every page of the website, in rotation with other large ads. Specs: size=199 x 401 pixels; format=jpg, gif, or png; color profile=RGB.